I'm working on my daughter's king-size and don't want to post it yet... also working on a charity baby quilt from a panel. I'll post it when the elaborate border is done. Don't have room on my design wall for it yet so picture taking is a bit more challenging. 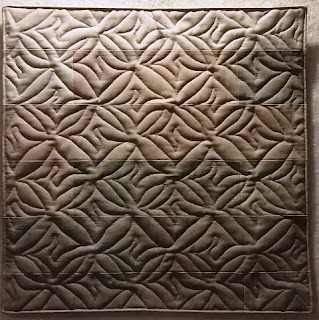 A woman in our guild says that she takes every bit of her leftovers from a project and makes blocks out of it, usually 4 inch 4-patches. Wish I'd heard that years ago! 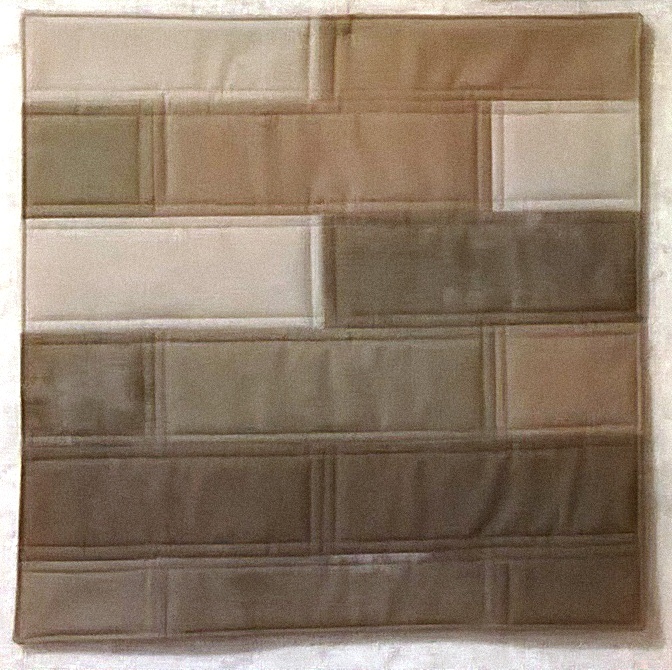 I make a twin quilt and had just small pieces left over and made these 6" blocks. I love them and will use them in something -- as long as I don't give in to the temptation and turn them into mug rugs. With sashing, they could be a small mat?? Here us another idea for a larger scrap. It is a small gift or jewelry bag. I left my hand in so you can see the size, about 5" x 7" and quick to make. The drawstring dresses it up. If anyone has more ideas for leftovers besides the usual scrappy quilt, I'd love to hear about them! I made one, but now have to do this again. The blocks are like a kaleidoscope -- impossible to put down because of the surprises. 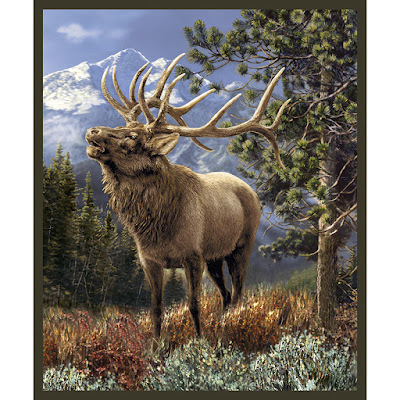 Also, I joined a Facebook Group called OBW and they are putting the most colorful and surprising quilts online. Some are made with prints using repeats and some are made with panels. The idea is to buy 7 and incorporated the hexies around one panel. Here is one example. 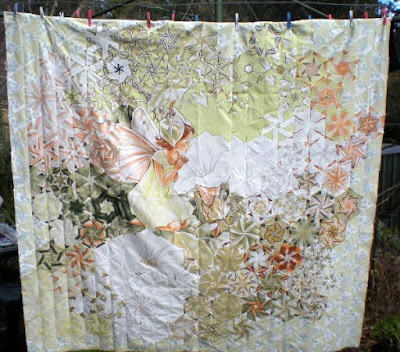 The photo isn't the greatest but I love the way the quilter blended the blocks and framed the little angel in the panel. BTW, if you want to join that group, they ask that when you post your project, post a photo of the original fabric... so take a picture before cutting it up. Here is a photo of the panels I have sitting in the wings to make a OBW. I'm itching to get started but still working on a king-size... Since this panel is 36" wide, it should make a rather large quilt too, once I get the hexies cut and arranged around it, etc. It was on sale at the Hancock's-Paducah online store. There are several that sell panels and some of them are really lovely. I was inspired by a pack of florals in my stash and a table runner pattern from the book "Skinny Quilts and Table Runners." I'd made one in pink florals for a charity auction and it was one of the first items to sell. This one uses the same blocks only more of them. It is 60" x 89" (she is a little lady) and quilted with a panto called "Breath of the Gods." I had to photo it draped over my long arm because I'm working on my daughter's king-size and it takes up my only design wall. However, all whining aside, this one is done and ready for its new home -- which is going to be built by early fall... so I didn't need to rush after all. 😊 It was hard to see - small stitches for the applique, and putting a black facing on black backing with black thread. If you have never tried that, I don't recommend it! And I made three mistakes doing the label of all things, but it is finished. About 25" square and for my daughter. Shhh, don't tell her. She asked me to make it, but by now she may have forgotten! It will match the runner I made for her awhile ago. 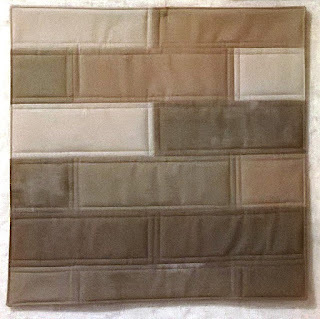 My daughter asked for a king-size but simple quilt, just subway tiles in shades of taupe. She gave me a cushion cover in the color she likes, so I used it to pick the fabrics. Then I took a few of them and made two cushion covers, one in simple quilting that is like bricks and the other using a panto that she liked. She picked the panto. Now to get all those bricks cut out. They will finish at 3" x 9" so that is a lot of cutting. With my neck and shoulders acting up, I can only do a few at a time. Hubby enlarged my design wall, so that is a blessing! I'd like to find a couple more darker taupes though. Not an easy task. Some of what I bought has a bit of texture in it. At first she wanted all solids but that was not possible. Once she saw these samples, she was happy (even though I worried that one of the colors was too brown). Commissions are not always easy, even if they are simple patterns!! 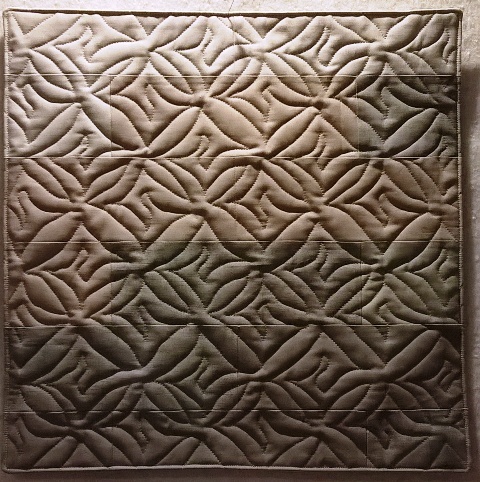 No quilting for a few days, partly because of a seized up neck/shoulder muscle, but mostly because I had the privilege of attending a two-day quilting symposium with Ricky Tims. I cannot say enough. It was amazing. 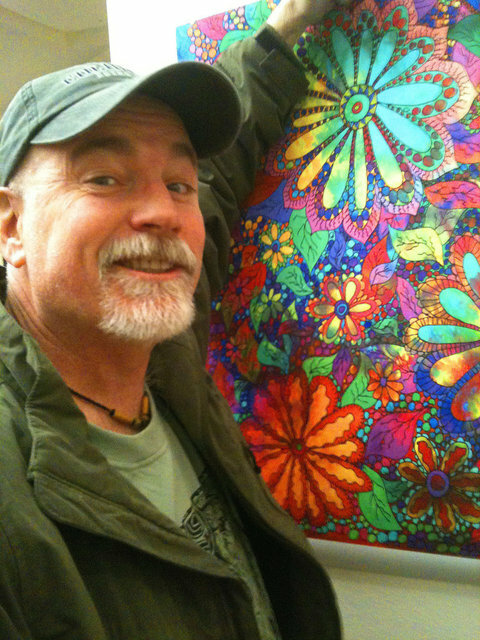 He is considered one of the thirty best quilters in the world. Not only is this man a good teacher, he is also entertaining, humble, plays piano with such sparkle that you don't know whether to cry or get up and dance, teaches photography, and can tell stories with a delightful flare. I had a fabulous time. I've made his designs (except the cave man style) and marvel at how he makes elaborate simple. These two days were loaded with new ideas and tips, plus a huge amount of encouragement -- well worth the time and fee. If you have never gone to one and get the opportunity, go. You will not be disappointed. My hubby, a non-quilter, went to the session last night and is still raving! Hopefully, I can soon post a finish. In the meantime, I've a heating pad on my neck and looking forward to another date with my message therapist! Applique done on this one during hockey, curling, etc. on TV while it is too cold outside to do much else. Yes, if you look closely there is a pin in this. It marks a spot that needs a bit of TLC. Otherwise, I need to press it, quilt it, put on a backing and a label. This one has 150 blocks that will be 6" finished. It will be about a twin and is for a lady who will be 90 years old next Tuesday. She is sharp, spry and classy. I keep telling her she needs to share where she gets her amazing wardrobe. Anyway, she doesn't know I'm making this but when she told me she wished she had a quilt for her bed, the Lord whispered "Do it" in my ear.